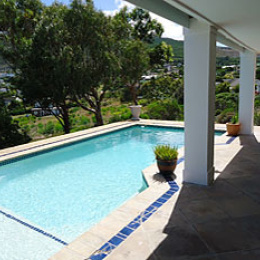 This home is situated 5 minutes drive away from Noordhoek beach, local shopping areas, restaurants and bars. The house comprises a large open plan living room, dining area and kitchen downstairs which flows onto the paved pool terrace. A lovely fynbos garden surrounds the property. There are 3 bedrooms, 2 bathrooms (1 en-suite), study and TV/library room upstairs. These rooms open on a spacious balcony offering beautiful panoramic mountain and sea views. The villa is fully and tastefully furnished and equipped throughout. This peaceful, private holiday home offers beautiful panoramic views over the Noordhoek valley to the sea and mountains beyond.